Users ask us about what specific smartphones and tablets should have before they start using Timbeter. We also receive requests from trial users concerning different devices, so that they can adequately test all of them and check the quality of the images, detection and overall functions of a tablet or smartphone right after the first measurement. We’ve decided to compile some of the most related issues associated with gadgets for using Timbeter. This is a very personal question. While some users prefer to focus on practicality and have a device that is always around, others prefer to optimize the screen as if it were a real tool. If you’re looking for a device with a smaller screen with good resolution and strength, plus the ability to take Timbeter anywhere you go, a smartphone with a display between 5” and 5.5” are right for you. However, if you want robustness, a big screen to capture all the details and want to use Timbeter separately from other functions, a “note” tablet model is the right model for you. Overall, our recommendation is to use a screen that has between 5” (smartphone) and 9” (tablet), to capture all the details and use Timbeter to perfection. 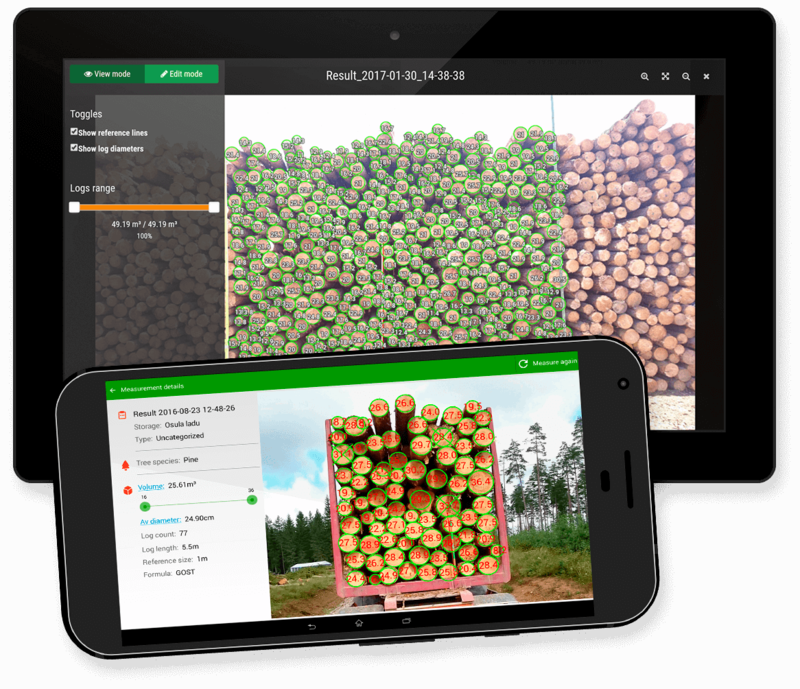 Usually, our users ask if the quality of the camera is vital in detecting wood logs with Timbeter. Yes! The resolution is crucial so that all logs are identified correctly by our neural networks. Imagine the camera of your device working as a human eye and sending the captured images to the brain, like the detection information taken to Timbeter’s AI. If this “eye” does not have perfect vision, essential details will be left behind. Our team’s recommendation is that tablets and smartphones that use Timbeter have a rear camera with a resolution of at least 8 megapixels. On smartphones with dual cameras, only the primary camera will be used, so check all the specifications of this camera beforehand. It’s no use buying a high-end device to work on a daily basis if it does not provide the least comfort when using it. A very compact smartphone can bring visual difficulties and touch with little precision, while an exaggeratedly large tablet can be physically uncomfortable to be maintained at 90 degrees when making measurements with Timbeter. Take ergonomics into consideration when purchasing a new device, after all, it will be part of your daily work with Timbeter. You can also invest in “case” type protectors to ensure comfort when using the chosen device. The newest devices are certified against scratches, falls and even accidental “dives.” Currently, the market is making smartphones with “IP” certification, which makes the devices waterproof in case of heavy rains or contact with water in general. If you are using Timbeter in a region of heavy rains, considering a model that allows you to continue using our solution even in unfavorable climates may be a great option. In the case of a device without the “IP” certification, it is worthwhile to find protective covers that make the device more robust. In regions of strong sunlight, the user may have difficulty viewing the phone screen in extreme luminosity. In this case, invest in Amoled or Super Amoled screens, which guarantee low reflection in unfavorable climates and good black and white balance. If your device relies on a different screen, anti-glare screens can also be used. Do not forget that your device should also have some screen protection since when working with logs, we are always subject to dust, scratches, and sawdust. You do not have to invest an absurd amount to have the ideal device to use Timbeter. As we said earlier, working in fields, log yards and forests require a device to be, let’s say, prepared for different conditions. So called “mid-range” devices that have memory and camera features of the “flagship” yet affordable devices are ideal for using Timbeter. It is also important to check some internal components such as RAM and storage capacity. RAM, in a simplified way, is how your device works, how fast or slow it responds to commands, and how much it can handle different functions. A good RAM (currently, smartphones have between 3GB and 6GB) run Timbeter with excellence, including the Panorama functionality. The storage capacity is basically how much “stuff” you can store on your device. Keep in mind that even with Timbeter’s synchronization with the Web Storage Module, measurements are still saved on your device, so you can edit or redo them. New devices with capacity for external memory (memory cards) are an excellent choice for storing. Ready to start your tests? Contact us and ask for a free trial!